Up to and including 1995, it was the LCA Knockout Cup. 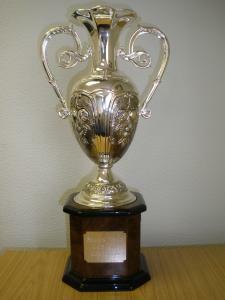 Since 1996, it has been the LCB Knockout Cup. 1 1972 Timperley Westhoughton Old Trafford . 2 1973 Blackpool Denton St Lawrence Old Trafford . 3 1974 Fleetwood Leyland Motors Old Trafford . 4 1975 Blackpool Barnoldswick Old Trafford . 5 1976 Denton West Leyland Old Trafford . 6 1977 Egerton Lancaster Old Trafford . 7 1978 Little Lever Ormskirk Old Trafford . 8 1979 Lancaster Milnrow Old Trafford . 9 1980 Blackpool Horwich Old Trafford . 10 1981 Lancaster Chorley Old Trafford . 11 1982 Lancaster Vickers Sports Old Trafford . 12 1983 St Anne's/Vickers Sports - shared Old Trafford . 13 1984 Blackpool Oldham Old Trafford . 14 1985 Lancaster Werneth Old Trafford . 15 1986 Fleetwood Farnworth Social Circle Old Trafford . 16 1987 Farnworth Social Circle Dalton Old Trafford . 17 1988 Bootle Lancaster Old Trafford . 18 1989 Blackpool Milnrow Old Trafford . 19 1990 Blackpool Milnrow Old Trafford . 36 2007 Bootle Greenmount Liverpool/Greenmount . 40 2011 Greenmount Walkden Old Trafford . 41 2012 Bamford Fieldhouse Northern Old Trafford . 42 2013 Northern (bowl out) Bamford Fieldhouse Old Trafford . 43 2014 Ormskirk Norden St Anne's .